Fixed costs for clinical negligence cases have the potential to create an uneven playing field, attendees of the Clinical Negligence Debate heard last week. Claimant and defendant lawyers gathered in Manchester on 28 February to hear from a range of expert speakers, including Peter Walsh, chief executive of Action against Medical Accidents, and the Lord Faulks QC. Walsh said that fixed costs for clinical negligence cases, which are to be the subject of an expert working group following the publication of the government’s consultation on the subject, would create an uneven playing field that would lead to a “perverse incentive to bring back a deny and defend culture”. Ian Cohen, head of clinical negligence at Simpson Millar, speculated that “the law of unintended consequences will work both ways” if fixed costs reform is introduced in its current form, with more specialism likely, as well as a rise in claims management companies active in this area. The Lord Faulks QC (pictured) warned that any reform in this and related areas is unlikely in the short term, thanks to Brexit dominating parliamentary time. “Some modification of the personal injury discount rate is likely, although to what extent is unclear,” the Lord Faulks QC said in his keynote speech. But nothing major will occur in the short term, according to the Lord Faulks QC, who thinks only “modest changes” are likely. In the meantime, the Lord Faulks QC suggested a more defined cross-department strategy, particularly across the Department of Health, the Ministry of Justice and the Treasury, might be helpful, considering the unintended impact of changes to the personal injury discount rate, for example. The discussion on the benefits and drawbacks of fixed costs reform also considered what can be done inside the NHS. Knee surgeon Mike McNicholas and anaesthetist Jim Watts debated informed consent following the 2015 Montgomery v Lanarkshire case, largely agreeing with the principles that underpin that decision. Watts agreed, saying that the biggest expense in the NHS is time. Staff need to be more ‘patient-centric’, but they are also only given short windows to discuss treatment. 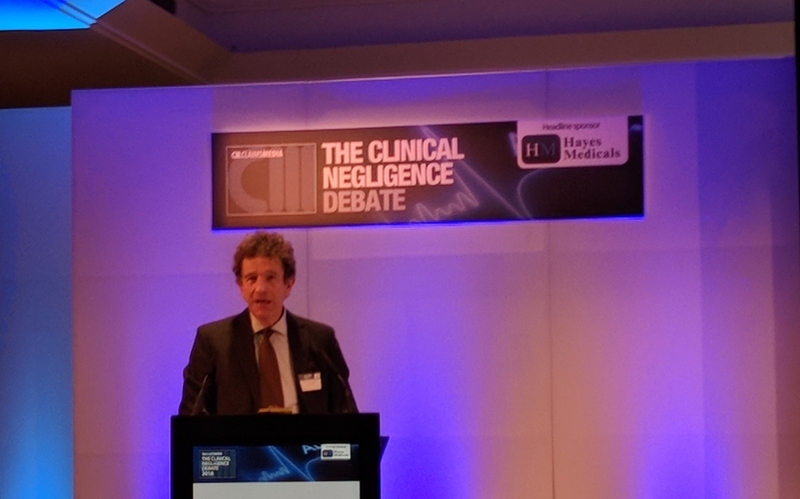 The Clinical Negligence Debate, organised by Claims Media, was staged with the help of several key sponsors, as well as an expert line up of speakers and panellists.